The Sunshine Coast team have been proclaiming Christ Jesus to the people of Nambour and Mooloolaba over the last month or so. We now meet up on alternate Wednesdays at The Plaza in Nambour and at "The Loo with A View" in Mooloolaba. If you would like to join us please contact me at kevinred@operation513.com. Firstly may I thank all those that have been praying for our Sunshine Coast outreach. As you all know we have had some issues in the past with the Police and Council in Nambour, however of late we have been given "permission" to preach and engage in one-on-ones as well as pass out tracts. 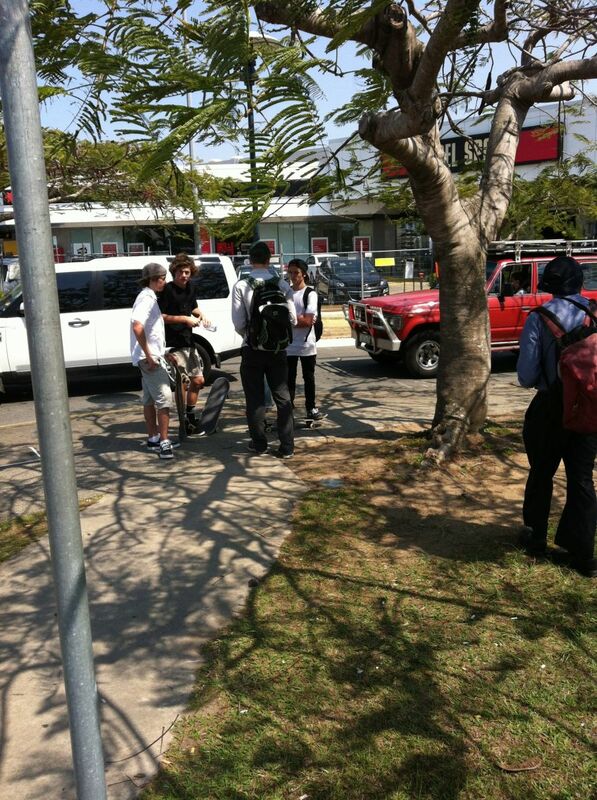 It seems business and the authorities in Nambour have come to accept our ongoing regular outreach. I must say many people have stopped to encourage us, with offers of prayer, donations of bottled water for the team on hot days, and some encouraging words with the occasional hug or two. We have also established a regular fortnightly outreach in Mooloolaba. The Police particularly have been very helpful in assisting us to proclaim our Lord and Saviour in a busy area with lots of passing foot traffic. The police have set a couple of conditions regarding public safety (due to the proximity of the road) of which of course we are more than happy to comply with. A big thank you to the senior officer in Mooloolaba for all the time he has taken to assist us with proclaiming the Gospel and the safety of our listeners. Our outreaches have been going well, the regular team, Justin, Ryan and I have been meeting for prayer at the start of the day, prior to preaching and passing out tracts. We have had so many conversations and many have stopped to ask questions or find out more about our message. We have given away many free bibles and literally 1000's of tracts. All of us take it in turns to preach "on the box" and it is fantastic hear my brothers proclaim the Gospel. The Gospel is like perfume to those that love Christ and I must say I learn more about my Lord each week by listening to my brothers express His glorious Gospel in so many different ways. Many people stop to listen, some love the message and some become angry and reject it, however the Gospel is always proclaimed faithfully without compromise. Please may I ask that you pray for our Sunshine Coast team? We really need faithful laborers to join the harvest on the coast. The beaches will soon be busy as the summer heats up, will you serve your Lord this season? 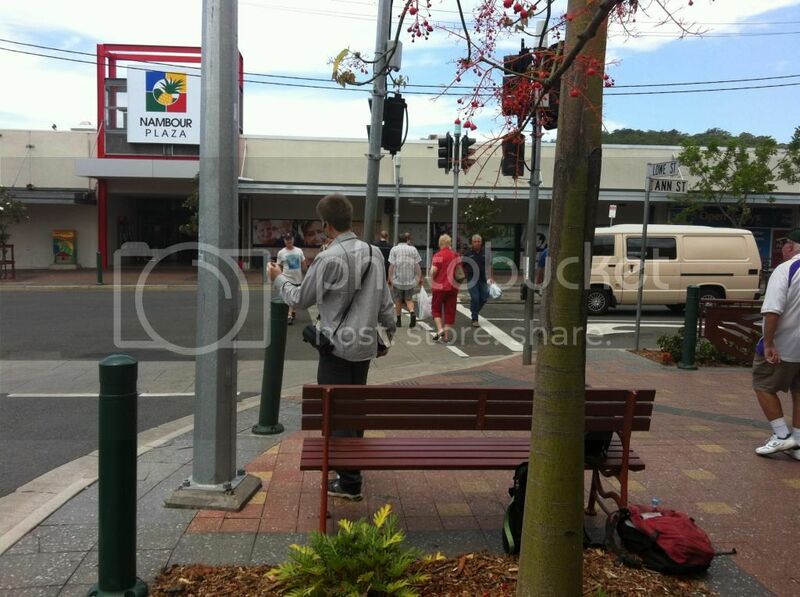 Here are some pictures of the team in Nambour last week. Sunshine Coast Outreach and Legal Update. Ryan, Justin and I attended Maroocydore Magistrates Court this morning to have a date for our trial set. The process was fairly quick and a date was set for early February 2014. We look forward to being able to defend our rights to participate lawfully in an Authorized Public Assembly under the Peaceful Assembly Act 1992 without fear of being moved on or arrested. We look forward to being free to preach the Gospel of our Lord and Saviour lawfully on the Sunshine Coast, so please pray for the team. After court we all headed off to Nambour to the library where we prepared and submitted our "Notice Of Intention To Hold A Public Assembly" forms which we then delivered to the local police station and the local council offices. We then traveled to Mooloolaba to share the Gospel. I love to witness as we meet so many different people. I met several Christians today and talked to them about coming out and sharing their faith with others. Most Christians we meet tell us they don't feel equipped and are scared to share their faith. It's always a great privilege to explain that I once felt like that and I still do from time to time now. I explain that our teams are here to help train people and encourage them as they did for me. I love to tell them of how much I enjoy the fellowship of being part of the Operation 513 family and what a privilege it is to serve along side my brothers and sisters in Christ. I pray that the people I shared time with today will feel convicted to join our team and help us to proclaim our Lord Jesus Christ to the people of the Sunshine Coast. The harvest is plentiful but the laborers are few. One of my conversations this afternoon, was with a gentleman that was on holiday from New Zealand. He was a member of his local Anglican Church there and had been for many many years. He told me he was involved with many difficulties his home church was facing as many within wanted to accept non-biblical and liberal ideals into his church. He told me of the recent battles he had been involved in and the progress that had been made, he seemed resigned to the fact that this was going to be a long and hard and ongoing process. I was encouraged to hear somebody so willing to contend for the faith, and to hear of his desire to keep his church on a biblical track. Please pray for Malcolm. It's been hectic for several weeks now with the arrests and legal challenges we have been facing. We have all been arrested twice, falsely imprisoned and had to make several difficult decisions regarding these things, however we as a team have decided to fight for our rights to political and religious freedom in Australia. I am going to avoid commenting on our current legal battle for the time being except to state that things are proceeding as expected and we are actively seeking to legally gain our civil liberties and freedoms on the Sunshine Coast. Please could I ask you to pray for our ministry and the government and it's representatives at this time. This morning Ryan, Justin and I met early as we had been invited to attend a meeting with council. We met and prayed and then we travelled to Nambour to the meeting with the council. The meeting unfortunately was as we expected and was really a waste of time and an opportunity again for the council to tell us how wrong our interpretation of the law was. We left upbeat thanking God that he would use this meeting to further His purposes. Due to bail restrictions we we unable to preach in Nambour today so we headed to Maroochydore and met with a friend named Michael. Michael is a local Christian businessman and a keen evangelist. Apart from most graciously providing lunch for us he also told us the best spots to preach and give out tracts in the area. So having enjoyed a meal and some fellowship we headed to the Plaza. We set ourselves up outside the Plaza and passed out many tracts and we all got involved in conversations. Ryan spent some time with three young lads, one of the lads said he was a Christian but his brother had talked him out of it of late. He seemed keen on finding out more and all four had a long conversation together. The young men all said they would think about things some more after Ryan explained the good news to them. As we were leaving and heading back to the car, I was giving out tracts and then I met with another young man who said he wanted to find out more as he was unsure about the Christian Faith. We talked about the ten commandments, sin and the coming Judgement followed of course by the good news. He was happy to take a free bible and an invitation to a Christianity Explored course invitation from my local church. Please pray that he will repent and put his trust in Jesus Christ and that he will read the bible and attend the course to find out more. We then headed for the crowds at Mooloolaba beach. I started the preaching off reading from Romans 1, and talking about how although people know the truth of God they suppress that knowledge in favour of living selfish sinful lives denying all knowledge of God. I was near a large coffee shop and many people turned to listen to the message. I was approached by three "lighthearted" hecklers, who I had a fruitful conversation with. I pray the Lord left them with something more serious to consider than they had expected I ended the preaching with a call to faith and repentance, and also a thank you for listening to the captive coffee shop audience. We moved along the sea front giving out tracts as we went and finally we found a suitable location for Ryan to preach. As Ryan preached several business owners appeared claiming we were breaking the law. One particularly said he was a Christian but didn't think that Christians should disrupt business. Ryan continued as Justin and I talked to the business owners and passed out many tracts. Further along the seafront again Justin got up and preached. I could see several people actively listening to his message. Justin is much more softly spoken than Ryan or I, but he used his tone and knowledge of the scripture to full effect as people had to turn an ear to listen. I really enjoy listening to a gospel presentation from Justin and wish I could sometimes just sit and listen, but quickly Ryan and I both got into separate conversation with professing Christians. Of course anyone who professes to be a Christian is asked questions so we can be sure if they understand the gospel. The young man I got talking to was very excited to hear the preaching and his gospel knowledge was sound. He was on holiday from NSW and was enjoying some family time in Mooloolaba. We talked about preaching and evangelism and he considered it very important personally which was of course a pleasure to hear. I pray as he grows he keeps this conviction and learns to actively share his faith. I pointed him towards some good free resources to look at when he got home. For me today has been an absolute privilege, I have enjoyed serving my Lord and saviour and working with Ryan and Justin who I love as brothers in Him. I thank and praise God for giving us all a day without hassle from the police or council as we preach and also for the many encouraging words and conversations we have had. Ryan, Justin and I met this morning and after traveling to Nambour we set straight to prayer. During the week, since our last outreach, we all received $550 fines in the mail, for preaching with an amplifier. 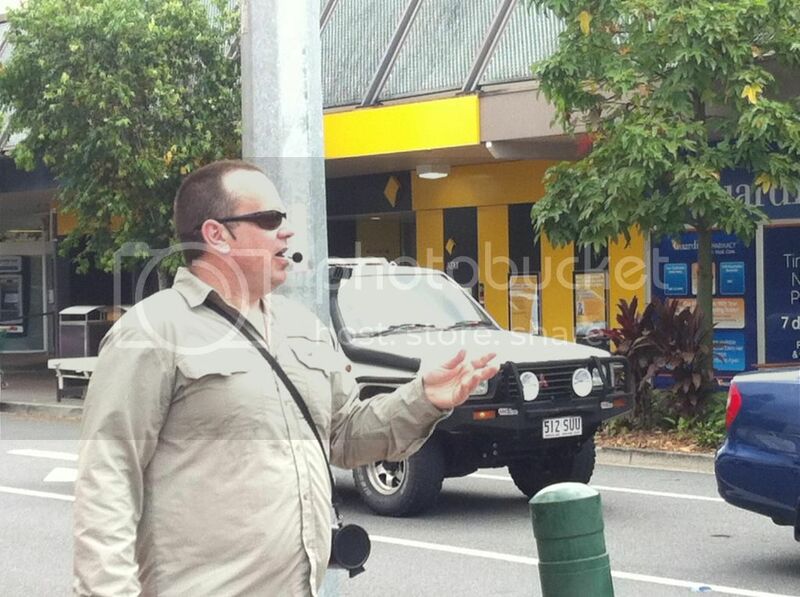 Over the last few weeks we have been meeting in Nambour under the peaceful assembly act. This act allows anyone to hold a public meeting on public land. The act also provides provision for the use an amplifier, so we know we are acting lawfully. We of course have all opted to attend magistrates court instead of paying the fine. So we set to prayer and prayed particularly for the council officers. We prayed that the Lord would give them an understanding of the local laws, and also that He would open their ears and soften their hearts to the gospel of our Lord and Saviour. Following our time of prayer we took it in turns to preach and gave out tracts. Many people stopped to listen to the preaching and also to engage us in conversations. We met many who openly rejected Christ, but a few people today embraced the gospel and gave professions of faith. It always is a great privilege to see someone convicted by the Holy Spirit, to be repentant and to put their trust in Christ. Ryan had an interesting conversation with a man claiming to be a Jehovah's witness. Ryan soon released that this man was not completely following the watchtowers teachings and set about answering his questions and exposing his lack of understanding with the bible, you could see the man was thinking and not just rejecting the scripture. He said he would read the Bible and think more about it. Please pray that he will come to realise the error of the false teaching he has received and come to repentance and acceptance of Jesus Christ as his only saviour. I particularly was uplifted today by the amount of Christians that stopped to thank us for sharing the gospel and to encourage us to continue. We are often criticized for sharing our faith openly in public, so it’s always edifying to hear support from our brothers and sisters in Christ. May I encourage Christians everywhere to just give a simple word of encouragement to anyone who stands up to share their faith, as it does uplift spirits and lead us to praise God and thank Him for the privilege of sharing His glorious gospel. As we approached lunch, we were approached by our local “regular” representative of the council, Matthew Bell. He started by quoting the bible, Romans 13:1-7, which we thought was an interesting approach and very unusual for him. We did explain we were happy to submit to the authorities as we were in fact acting lawfully and in compliance with the laws, however we could not submit to officers who were acting unlawfully by continually stopping a lawful public assembly. He offered us some forms to apply for a public assembly and stated they had never received our application forms. We happily showed him our proof of postage and delivery notifications regarding the said paperwork. He had already been to see the local police Senior Sergeant who had kindly told us he had received our applications a couple weeks previously. It seems that the council had lost our application forms. Thankfully Matthew was able to obtain copies from the very helpful senior sergeant at Nambour Police station and we explained we were happy for him to use those as originals under the circumstances. Many thanks to the senior officer at Nambour police station. It now appears that Matthew and the council are happy we are acting under the peaceful assembly act, however he stated that they are still unhappy with our use of amplification and also our handing out of Christian gospel tracts. So it seems they don’t understand the application of this law either which again is no surprise. So we will continue to preach and hand out tracts and God willing we will see what happens next. I think its so important to thank God for our religious freedoms in Australia. I have been preaching the gospel on the Sunshine Coast for some time now with no objections from Police or council, however since we have been preaching in Nambour we have encountered weekly opposition particularly from the local council office. One thing we must bare in mind is that we are not trying to be obstructive or to waste anybody's time. It is still a legal right in Australia for us to meet in public and to practice our religious and political freedoms. I personally feel as Christians we must stand to protect these freedoms as we are called to do so. We are all commanded to share the Gospel of our Lord Jesus Christ and this is of utmost importance, but we must also protect our religious freedoms or we will lose them. May I please ask you to pray for the Sunshine Coast team particularly at this time, please pray that we receive the grace, strength and the wisdom we need to serve our Lord and to bring glory to Him. Today I met with Ryan, Justin and Bek at Aussie World and then travelled on to Nambour to share the Gospel. When we arrived we spent time in prayer, thanking God especially for the privilege to be able to preach His glorious gospel to the people of Nambour on such a beautiful day. We prayed especially for wisdom and strength and that the Lord would lead us into many conversations. I started preaching as soon as we arrived. I could not wait to share the message of salvation through Jesus Christ and Him alone. I read from Acts 17; 22,31. I talked about how God had created our world and everything in it, I told the people God was not unknown but know to all of us, I told them that it was God that had given us the very breath in our lungs and the blood in our veins and our skin which felt the warmth of His sun and eyes that saw His handiwork in the glory of creation. I went on to explain that because we knew God but did not honor Him, we had made idols of ourselves, we put ourselves before our very creator, the living God. I went on to tell the people that the times of ignorance God had overlooked but now he commanded all people everywhere to repent, because he has fixed a day in which he will judge the world in righteousness, by a man who He appointed, and to give His assurance of this He raised him from the dead. I explained that we had all fallen short of the glory of God, we all deserved Gods wrath and just punishment. I begged with the people to put their trust in Jesus Christ and to repent. I told them the only way we could stand before a righteous and holy God on Judgement day was to repent and to believe Jesus Christ, to put our trust in Him and Him alone. Only Jesus Christ offers us the free gift of Salvation. I felt so emotional and I thanked God as I finished sharing His Gospel. I then joined Justin passing out tracts and getting involved in conversations with passers by while Ryan preached. I soon got involved in a conversation with an elderly lady who was lovely to talk to, she seemed a bit shocked as I explained the law, but soon after, made a profession of faith and promised to repent and to live a life pleasing to God. Please pray for Silvia. Justin was engaged in a marathon conversation with a young lady, they both were sitting on a bench talking as a council officer arrived. Ryan continued to preach, not at all put off by his presence. It seems the council are still upset that we are using amplification during our authorized public assembly, although it is lawful for us to do so. They are also upset that we are handing out tracts which they believe to be "touting for business". The officer gave me a compliance notice for using an amplifier while I was preaching earlier and one to stop me from handing out Christian tracts. Ryan continued to preach. The officer wanted to stop the preaching and talk to Ryan, the officer really doesn't understand that he is acting unlawfully whist trying to do this, so Ryan continued to preach as under our public assembly he is entitled to do so with out interruption. Because the council officer did not know this law and just thought Ryan was being difficult, he decided to waste the local Police forces resources again. The police arrived. They talked to me and then stopped Ryan preaching. Ryan also was then given compliance orders by the council officer to stop using amplification and handing out tracts. Justin also received a notice to stop passing out tracts. The compliance orders told us if we continued our activities we will be issued with $550 fines for each individual matter. We again continued for the rest of the afternoon preaching and passing out Christian gospel tracts with no fines being issued or any more visits from police or council. We did fully expect to be given fines as the council are clearly unfamiliar with our rights to meet under the peaceful assemblies act, to use amplification and to practice our religious and political freedoms in Australia, so it seems we will be accepting fines and going to court if that is their wish. Please pray for the council that they will come to know the truth and also for the rights of Christians to legally share the gospel freely in Australia. After lunch Justin preached “on the box” or stoop as it was today, followed by myself again. Many people stopped to listen, some would comment positively and some would vocally reject the message. We were greatly encouraged also as several Christians stopped to tell us to keep it up! We all gave out many tracts and got into many conversations, some fruitful and some not. A few people over the course of the day gave professions of faith and said they would repent and pray for forgiveness. Please pray for them especially, but please also pray for those today that received tracts and heard the gospel, may they come to know our Lord and Saviour Jesus Christ and put their trust in Him and Him alone. We really could do with more laborers in Nambour so please consider joining the team, If you could help us we would love to hear from you. Please may I also ask that you pray earnestly that the Lord will provide laborers for the harvest. Had a good day and early evening out and about in Mooloolaba sharing the gospel. It was very busy today with many people enjoying the fantastic weather. Brad and I met up and following a time of prayer, we set ourselves up on a street corner and started to pass out tracts. I opted firstly for the Stop tracts. I think they are great because many people just automatically stop as they see the stop sign picture. They make getting into conversations very easy. The first conversation of the day was with a couple of older ladies. One lady was quite bossy and very unreceptive to the gospel, and she seemed very keen to not let me speak and to stop her friend listenening to anything I had to say, when I did have a chance. She believed their was no God and anyone who did believe had been brainwashed. I felt sorry for her friend because every time she tried to ask a question her friend cut her off. I pray someone gets to talk with the questioning lady soon. I didn't get chance to get her name as her friend dragged her off. The second conversation of the day was with Christine. She was a ex-catholic, and had given up on church long ago. She was convinced she was a good person and was definately going to heaven. We had a great chat and it was my priviledge to share the gospel with her. She was convinced her works would get her to heaven, so using the law I showed her that she was in fact a sinner and had fallen short of the glory of God. She was concerned by this but told me God was all forgiving, but I continued and showed her that a just judge would have to find her guilty and judge her accordingly, a just judge could not just let her go. She was visibly disturbed by this, so I went on to share the good news with her. She seemed relieved and was happy to hear the name of Jesus. I asked her when she would repent and put her trust in Jesus and not in her works. She promised me she would think about it. Please pray for Christine. The next conversation was with Lloyd. He was older man in his 70's I would think. He said he was very closed to all religion and was happy to quote many atheists and scientists and generally he would close any avenue of conversation. He suggested I didn't use the bible to speak about God. The conversation was long, and in the end I asked him If I could physically prove the existance of God and that the Bible was his word would he believe then. He said no... I asked him if he would let me prove the reliability of the Bible, he again said no. I expressed for a man quoting so many atheits and claiming so called scientific proofs he was very closed to conversation about such things. I left him with the thought that it was in fact God who was in control and it didn't matter which atheist had said what regarding God, the fact remained that we would all face judgement and on that day we would be judged by God's standards and not ours. I explained all liars would find themselves in the lake of fire and no thief would inherit the kingdom of God, but he rejected this. I decided not to give him the good news but to leave him with the fact that he faced Judegement by a God he knew in his heart existed. He suggested I read more scientific research... Please pray for Lloyd. Later on I met with some of the church I fellowship and evangelise with on Friday evenings. 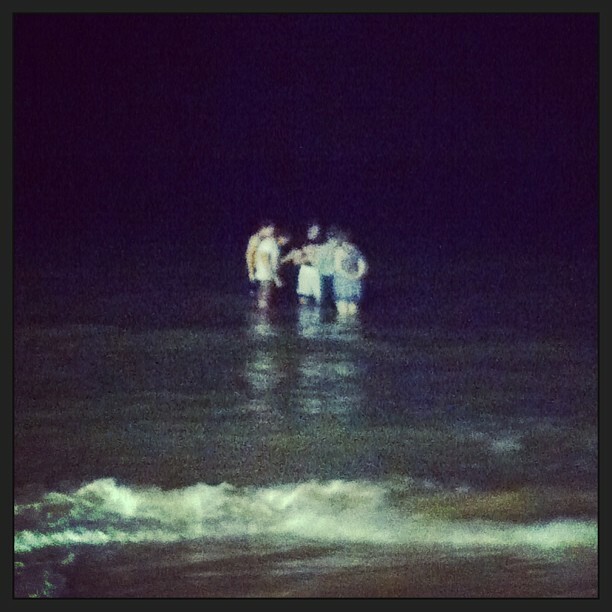 They were baptizing a new convert to the faith called Daniel in the sea. Its was great to see Daniel baptized and hear his profession of faith. Praise God indeed. Daniel being Baptised in the Sea at Mooloolaba. There were three of us today heading to Nambour and once we met, we spent a good deal of time in prayer, asking that God would allow the gospel to go out today freely in Nambour and that we wouldn't have severe opposition. The morning started out spectacularly. The first conversation that Kevin and I was with a lady in a wheelchair who said that she goes to a Brethren Church, but it turned out that she was trusting in her good works to get her to Heaven. So we explained how God's standard is perfection, but we do not live up to that at all. We went through some of the commandments with her, showing that she too had sinned against God and therefore was deserving of the punishment of being sent to Hell forever. We then had the pleasure of telling her the way in which God's justice can be satisfied and she can be let into Heaven, through the work of Jesus on the cross. Jesus has lived a perfect life 2000 years ago, suffered on the cross as the substitute for everyone who believes. For everyone who trusts in Jesus alone for their forgiveness and repents. This lady seemed to now understand the gospel and said she wants to trust in Jesus from that very moment. Please pray for her. We were having lots of great conversations, and we spent some time preaching from the step. As midday was approaching, two council workers came up to us saying we can't preach with an amplifier and we can't give gospel tracts out. They hung around for quite a while, while we just went back to witnessing. Two very high ranking police officers turned up a little while later, the Senior Sergeant in charge of Nambour Police Station and the Inspector for the whole region. They were very friendly people and we had very respectful conversation with them, they mentioned that they've had no complaints about us. We had been told that the officer in charge had let all his officers know that if anyone makes a complaint that they should let him deal with it and not them. For today we were protected from the police's move-on direction powers because we were there under an authorised public assembly. The conversation with the police went very well saying they've got no issue with us and they soon left. The council workers, however, warned that we were not allowed to continue preaching with an amplifier on council land or hand out gospel tracts. We explained that we were preaching from private property, not council land, and we were entitled to use amplification even on council land because we are protected under an authorized public assembly. And the tracts we were handing out advertise no business, commercial or trade activity. They threatened to fine us if we continued. We then went to lunch, came back and continued witnessing. Despite council workers seeing that we were continuing, they did nothing at all to stop us. Praise be to God that he allows his gospel to continue to be spread. Please pray for the conversion of many of the people we spoke, even the council workers, who got to hear the message as well. Had a good outreach in Mooloolaba today. Spent some time this afternoon with Brad Joyce from my home church and together we gave out many tracts and had several conversations in and around the "loo with a view" Brad hasn't been out evangelising for a some time and shared that he was nervous, however he was keen to share his faith with others, and thats exactly what he did!! It was a privilege to serve with him, his presence was an answer to prayer for me today. I look forward to our next outing. We have arranged to meet up again next Friday afternoon to do the same, so God willing thats what we will do. This evening was very quiet and not many people seemed keen to take tracts and conversations were few and far between. I think I'm going to outreach in Mooloolaba more often during the day time and in the early evening as its much busier and people seem more open to engage in conversation and take tracts during daylight hours. I realise I need to use my time as effectively and as wisely as I can. I spent some time talking to two Muslims from Saudi Arabia. They wanted me to watch a video on an iPhone (it was 32 minutes long), it showed footage of a christian convert to the Muslim faith and he gave an explanation of his reasons for doing this. I only watched a few minutes as it was clear the man was never a Christian as his understanding of the Bible was somewhat unbiblical, he also criticised the Christians he had grown up with and lived with. I told the muslims after a few minutes I did not need to watch anymore. I offered to demonstrate my reasons for my stance with scripture but they said they would not listen to me read from the Bible. They had no interest in anything I had to say but just wanted to tell me I was wrong and the bible was wrong. They also told me that no muslim has ever converted to Christianity. I have heard this before from other muslims. I expressed I knew Christians that were once Muslims but they refused to believe me. I told them of the coming Judgement and why we needed a saviour but they rejected the divinity of Jesus as and the authority of the Bible outright. I quickly realised that they were not interested in hearing what the word of God said, but were only interested in telling me that Christians were wrong. I pray the Lord will soften their hearts and open their eyes. Please also pray that all the tracts we gave out today will be read and that the people we talked to will be convicted by their sin and realise they need the one and only saviour and that they will come to repentance and putting their trust in Jesus Christ alone. What a day in Nambour. There were four of us on public land in Nambour, Australia and we were getting into friendly conversations with people walking past about whether they thought they were going to Heaven preaching the great gospel of Jesus Christ. We also were giving out gospel tracts, which sell nothing, advertise no business, instead they simply have the message of the gospel of Christ on there. Two police officers approached us near the start of the day, asking for our identification. We asked whether we had committed an offence, he said no, so we said that we do not have to give him our personal information. This is where the first video below starts. I then asked him about whether he was a police officer because he was not wearing a name badge. I was unsure whether he was. At this point the police officer responds by calling me "mentally retarded". These two police officers soon after just left us alone and said they'd make some inquiries. After lunch, this is when the Sunshine Coast Council decided to pounce on us. The council law local law officer Matthew Bell said "It is an offence to approach someone and give them the Christian literature". He then proceeded to say that we would would fined $550 for doing that. We asked him to show us the law exactly where it says we cannot do what we were doing, for we had researched already all the local laws and it says nothing of the sort. In fact, we even contacted the council last week about this, they said that it is not illegal to hand out gospel tracts or approach people to speak about Jesus, nor even is it illegal to stand on public land to preach the Bible. We told the local law officer this, but he refused to listen to us and then called the police on us. The police arrived and spoke it us saying that they are not familiar with the council by-laws at all and they said that they think we've gone down all the right avenues, seeking out the council about whether it is okay to do this or not. But then the police spoke to the council local law officer that was still standing around and he convinced the police officers that it is wrong to approach people with Christian literature. We then showed the police exactly what the local law prohibits. Under schedule 3 of local law 4, touting for business and distributing business advertising is prohibited. What we were doing is neither. The police would not listen, and said they they are giving us a move on direction to leave the whole Nambour CBD for 4 hours for the reason of "handing out literature" - which is not a legitimate reason for a move on direction under the Police Powers and Responsibilities Act section 46. Here is a 4 minute summary of the issues we were experiencing with the police and the council. Here is the full conversation with the first police officer in the video above (8 minutes long). But the gospel still went out today to many people. So to God alone be the glory! To the God who is the King of Kings!